The best maitake mushroom supplement can rid you of poor mental concentration, boost your focus, fight fatigue, improve skin health, increase energy, fight cancerous tumor growth, fortify healthy cells, increase longevity, bluster immune system health, and improve physical performance. With that in mind, the Onlinestrength team set out to find the absolute best maitake mushroom supplement in the world so that you wont have to waste time shifting through vague product reviews and research articles. 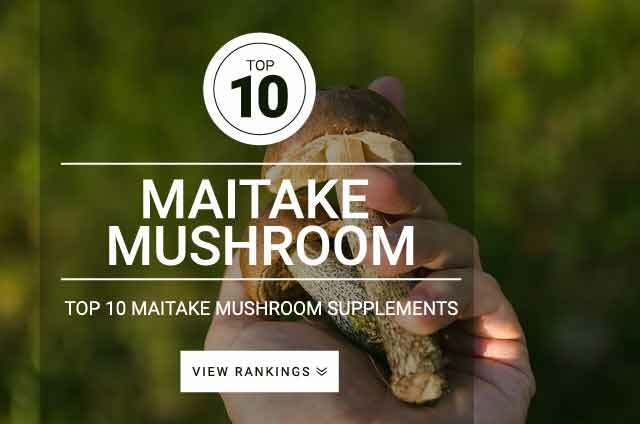 Onlinestrength analyzed 10 best-selling maitake mushroom supplements in the United States for organic maitake mushroom (grifola frondosa) and total polysaccharide content. We reviewed 147 different scientific research papers, scoured over mushroom articles, analyzed dozens of mushroom extract brands, and consulted with experienced herbalists and other industry experts. The best supplements were made using organically grown maitake mushrooms, contained no artificial coloring, fillers, binders, or preservatives. If in capsule form, the capsules were plant based. PS: After testing the top then maitake mushroom brands, Mushroom Science Maitake Full Spectrum Extract was our favorite. Maitake mushrooms are used medicinally to boost heart health, cure cancer, prevent heart disease, improve gut health, increase longevity, bluster immune function, and improve cognitive function. Herbalists classify maitake mushrooms as adaptogens, substances said to help the body adapt to stress and help to prevent infections (similar to holy basil, ashwagandha, and bacopa monnieri). Recent research is verifying what natural Japanese herbalists have known for centuries — maitake has an incredible range of remarkable health benefits. Fights Infections – studies have pointed out that maitakes adaptogenic properties increase the bodies ability to fight against numerous diseases or illnesses. Prevent Tumor Growth and Cancer – maitake mushrooms may potentially slow growth of tumors in colon, lungs, stomach, liver, brain, and other organs by protecting healthy cells from becoming cancerous and by preventing metastasis. Improve physical health – boosts your ability to fight fatigue and resit all types of illnesses. Immunological Effects – numerous studies show that maitake has very powerful benefical effects on your bodies immune system health. Maitake has been shown to enhance cytotoxic T-cells which help attack tumors. food supplement, or in the medical industries. Skin Benefits – regular use of maitake mushroom has been shown to help reduce free radical scavenging damage, improving skin quality and vibrancy. Maitake mushroom (Grifola frondosa) is a Basidiomycete fungus that often grows at the base and on the roots of oaks, elms, and other trees. The name maitake is Japanese which means dancing mushroom. Maitake can be found in the northern forests of Asia, Europe, and eastern North America. This mushroom is well known for its unique texture and taste, but now there is an increasing interest in health benefits of this fungus. Several recent studies have shown maitake exhibits potent antitumor and metastasis effects by strongly enhancing innate immunity. A typical dosage of dried maitake mushroom in capsule, tablet, or powdered form is 3 to 7 g daily. Maitake mushrooms are edible and can be dried and made into a tea. Maitake mushrooms are a safe and natural way to strengthen your immune system and improve overall health and wellness. Supplementation of maitake mushrooms can really trump prescription drug antibiotics when it comes to its overall effects on your health. Most of the medicinal mushrooms on the market are very powerful when it comes to their natural beneficial effects. Daily supplementation of these types of mushrooms can do wonders in terms of energy and immune system dexterity. Maitake mushrooms work with your body’s chemistry to strengthen all aspects of your health. Eating mushrooms or taking mushroom supplements are highly recommend to keep optimal health all year round and to treat the other conditions mentioned. It won’t take long for you to notice the health benefits regular supplementation of maitake mushrooms can have on your health, often individuals notice improvements after just one dose.